I designed these two newspaper ads several years ago. The Spanish translation needs work - it was just a quick plug and play into the google translator. Civil rights leader Cesar Chavez's legacy and struggle continues today. But where do values like justice and compassion come from? Are right and wrong really just a matter or personal opinion? Or are there absolutes that go beyond what popular culture or society might dictate? Do we really believe that all opinions are equally valid? That injustice and oppression are no different than compassion and mercy? 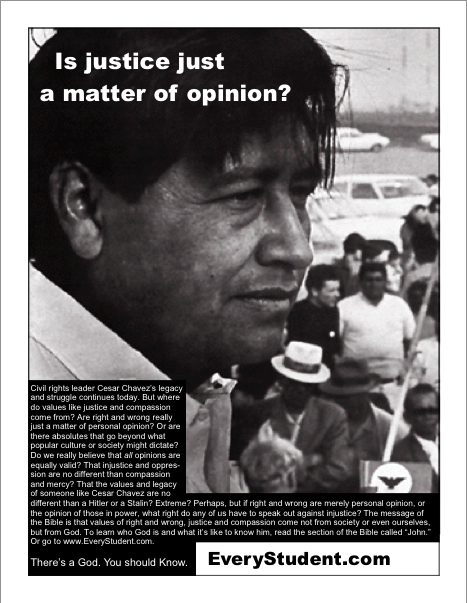 That the values and legacy of someone like Cesar Chavez are no different than a Hitler or Stalin? Extreme? Perhaps, but if right and wrong are merely personal opinion, or the opinion of those in power, what right do any of us have to speak out against injustice? The message of the Bible is that values of right and wrong, justice and compassion come not from society or even ourselves, but from God. To learn who God is and what it's like to know him, read the section of the Bible called "John." Or go to www.EveryStudent.com. There's a God. You should Know. 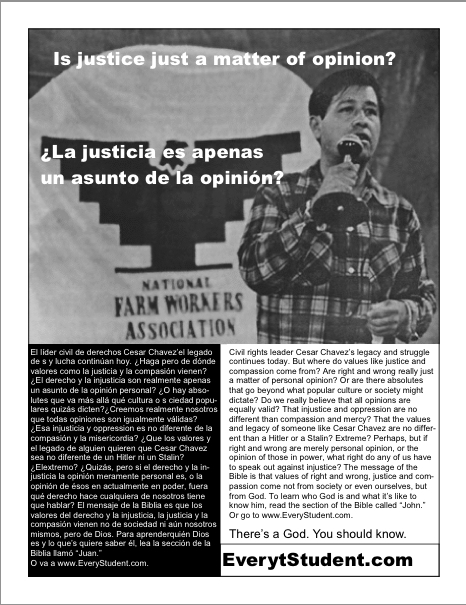 Here's a link to more about Cesar Chavez and his legacy. Yo, Dave! Just writing to wish you a happy 50th. God loves you and has a wonderful plan for your life. Great blog, David! And happy birthday, as well. You are right to connect justice with God - not only because of the standards He has set for us, but also because it is one of His essential character traits. It's centrality in the mind of God is noplace better expressed than at the cross of Christ. There we see both the extent of His commitment to justice and the immensity of His love for us. Justice, consistent with His holiness and righteousness, compelled even the sacrifice of His own Son in our behalf. He was made to "be sin for us, so that in Him we might become the righteousness of God." 2Cor 5:21 And the resurrection of Jesus from the dead both validated that atonement, and showed the promise of eternal life to all who believe. Hallelujah! He is risen! Happy Easter!